Author’s alterations: customer’s corrections/changes made at the proofing stage. These are charged to the customer. Binding: process of fastening papers together. Bitmap: a grid of pixels or printed dots generated by computer to represent type and images. Bleed: the printed image extends beyond the trim edge of a sheet or page. A bleed may occur at the head, front, foot and/or gutter of a page. Carbonless paper:paper coated with chemicals that enable transfer of images from one sheet to another with pressure from writing or typing. CMYK: abbreviation for cyan, magenta, yellow and key (black), the 4 process colours, which combined together in varying proportions can be made to produce the full colour spectrum. Collating: arranging of printed sheets into the desired sequence. Colour separation: process by which a continuous tone colour image is separated into the four process colours for print production. Cover paper: a heavyweight paper made particularly to protect inner, thinner sheets of such printed items as booklets. Crop marks: marks at the edges of an illustration or photograph to indicate the portion to be reproduced. DPI:dots per inch; measure for output resolution of various devices. Dummy:a mock-up made to resemble the final printed product which uses the proposed grade, weight, finish and colour of paper. Estimate:a price given to a customer based on specifications provided by the customer. The price can change if the order specifications are not the same as the estimate specifications. Flush:even with (as with to a margin). Four-colour process:reproduction of full-colour photographs or art with the four basic colours of ink (yellow, magenta, cyan, black). Gutter:line or fold at which facing pages meet. Halftone:picture with shades of tone created by varying size dots. Imagesetter:a device that plots high-resolution bitmaps which have been processed by a RIP. May include type, graphics and photographic images. It outputs a to film or paper. Justified:text which is flush to both the left and right margins. Line copy:copy which can be reproduced without using halftones. Make-ready:the work associated with the set-up of printing equipment before running a job. Over-run:copies printed in excess of the quantity specified in the order. Perfect binding:a bookbinding method in which pages are glued rather than sewn to the cover. Used primarily for paperback books. Point:a measurement for the size of type, distance between lines and thickness of rules. One point equals one seventy-second of an inch (0.3515mm). Ragged right:typesetting style in which lines end in unequal lengths on the right side (usually justified on left). 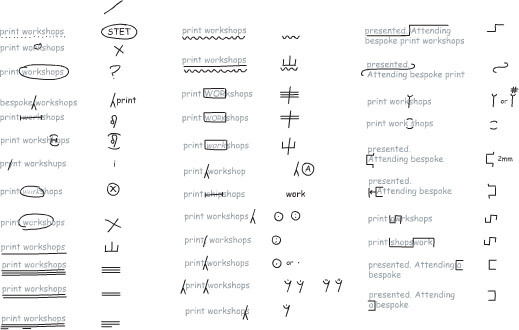 Registration marks:crosses or other marks placed on artwork which ensure perfect alignment (‘registration’). Reversed-out:type appearing white on a black or colour background, either a solid or a tint. Resolution:the number of dots per inch (dpi) in a computer-processed document. The level detail retained by a printed document increases with higher resolution. RIP (raster image processor):computer used to create an electronic bitmap for actual output. This may be built into an imagesetter or may be separate. Saddle stitch:a binding process in which a pamphlet or booklet is stapled through the middle fold of its sheets using saddle wire. Score:a pressed mark in a sheet of paper, usually a thick paper, to make folding cleaner and easier. Self-cover:the paper used inside a booklet is the same as that used for the cover and is generally printed on the same press run. Signature:folded, printed paper forming a section of a book; usually in a multiple of four, and more often a multiple of eight. Solid:an area on the page which is completely covered by the ink. Stock:the paper or card which is to be printed on. Tint:an area of tone made by a pattern of dots, which lightens the apparent colour of the ink with which it is printed.